Over on Instagram, I posted a joke about this card and the fact that it doesn’t say “a creature in play” or something like that. Now, of course this phrase does mean “a creature in play”, and it’s not technically a much more recently-printed alternative to Dark Confidant – unless your group decides that’s what it does in conjunction with R&D’s Secret Lair – but it does let you basically upgrade something of yours into something perhaps more threatening, and/or with a relevant ability. I’d be slightly wary of the fact that it becomes a Saproling or whatever again if the aura is destroyed, and my joke about Progenitus wouldn’t actually work because Progenitus can’t be enchanted and the aura would immediately fall off; but anything with an attack trigger or a powerful activated ability is a good target since you get the benefit right away. 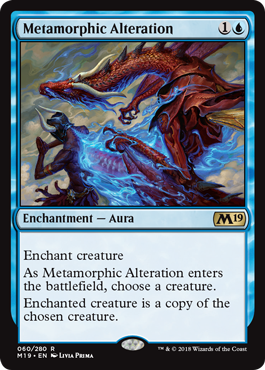 Also, did you know that if you somehow turn a planeswalker (preferably an opponent’s) into a creature, either by some trick involving Mycosynth Lattice and March of the Machines or perhaps by waiting until they used Gideon’s combat mode, and then use Metamorphic Alteration to copy it (giving it flash as relevant), you’ll get a copy of the planeswalker as printed? Granted, you’ll need to find a way to get at least one loyalty counter on it too, but it really seems like there should be a way to take advantage of that. You can do a similar trick with Opalescence, actually. A two-mana Clone effect? This comes with a minor downside: you have to supply the creature first. It certainly has its upsides, though; you may not get any coming into play triggers, but you do have the ability to swing with it immediately (if the base creature lacks summoning sickness). And you can, as is always the case with Clone effects, copy some of your opponent’s (or your) creatures with daunting walls of protective effects. I don’t think the card is amazing, but it is a solid-enough piece in most decks, its relative efficiency making up for some of its minor downsides. Another potential use, actually, is as a way to neuter a larger creature by making it into something smaller, so long as the creature you’re trying to cripple doesn’t have protection effects. Turning a large dragon into a copy of a squirrel is a good way to make it less menacing, all in all.